2000 Las Vegas Boulevard So. Enjoy the remarkable views of Las Vegas from its 1,149-foot tall Tower. It is truly a one-of-a-kind fixture in the Vegas skyline. You'll love Stratosphere's spacious and affordable accommodations, complete with luxury bedding, Strip or territorial views, and first-class service. The King of Pop and all of the Hits. Showcasing the pure joy of this legendary superstar and his music including "Bad," "Billie Jean," "Beat It," "Dangerous," "Smooth Criminal," "Black & White," "Thriller," "Don't Stop Till You Get Enough," and many more. Features live band and dancers. Located more than 800 feet above Las Vegas at the Stratosphere Casino, Hotel & Tower, the award winning Top of the World Restaurant offers a dining experience like no other. This Las Vegas fine dining restaurant features culinary delights served in an elegant atmosphere with unparalleled views of the city as the restaurant revolves 360 degrees every 80 minutes. McCall's Heartland Grill is a restaurant like you would find back home. The restaurant features an excellent array of steaks, seafood dishes, pastas, sandwiches, and specialty items such as a Half Rack of Chile Roasted St. Louis Ribs. McCall’s has an excellent mid-ranged wine list, great bourbons from the American whiskey trail, tasty specialty cocktails and a number of Craft style beers on tap. For intimate ambiance and authentic Italian cuisine, there's no place like Fellini's Ristorante Italiano at the Stratosphere Casino, Hotel & Tower. Executive Chef Joseph Siano brings more than 30 years of experience to classic and contemporary recipes, as well as his innovative signature creations from all regions of Italy. Let Chef Siano prepare an unforgettable meal for you and pair it with a selection from our extensive fine wine list. Whether you're out for a romantic evening, celebrating with a reception or hosting a corporate dinner, the attentive Fellini's staff will cater to your every need. No matter the time of day, this 24-hour café is there for you. Included in their offerings are traditional Asian lunch and dinner dishes from 11am-midnight. Featuring an expansive menu that includes three egg omelets, delicacies from the griddle, a wide selection of mouth-watering burgers, hearty dinner plates, house-made fruit pies, shakes and more, STRAT Café & Wok has something for everyone. Takeout available 24/7. Exuding sophistication and intimacy, this stylish contemporary beauty is a playground for all 21 and over to enjoy! Located on the 107th floor of the Stratosphere Tower, Level 107 Lounge offers a gourmet menu, prepared by the award-winning chefs of Top of the World restaurant. Indulge in a highly regarded list of specialty cocktails, bottle service and multiple happy hours. Come for the stunning views and stay to experience the undeniable value! Located on the 8th floor of the Stratosphere, our cafe and bar combines casual open-air dining and drinking with breathtaking views of the city. This menu is much more than burgers, hot dogs and salads. This unique menu is a fusion of American, Baja style and Pan Asian dishes. Enjoy the sun and splash time from the privacy of your own cabana. Select a package that lets you rest and relax in style with plenty of amenity choices. In a city where bigger is often promoted as better, Radiusº takes a different approach limiting entry to 150 people, day or night, and providing personalized attention to guests, including some of the best bottle service values in town. Enjoy breathtaking, panoramic views of the valley over 300 feet above the Vegas Strip. AirBar on Level 108 is the highest bar on the Vegas Strip. Experience Sin City from bold new heights at AirBar, towering 800 feet above the Las Vegas Strip on Level 108 of the Stratosphere Tower. AirBar is all about spectacular views, signature cocktails and a fun vibe. It’s the hot spot for checking out adrenaline junkies taking the ultimate leap of faith at SkyJump, the world's highest controlled descent located just a few feet away. Pop in for some liquid courage, or enjoy a cold refreshment while taking in the view. You never know who might be hanging out at the 24/7 hot spot CBAR. So if it's cocktails, video poker, DJ mixes – whatever your pleasure – this bar is for you. Come experience the bar that takes casino bar entertainment to a whole new level! If you're looking for a great party with live music, plentiful drinks, dancing – all with no cover charge - then you’re looking for Images! This popular lounge on the casino floor is the place to be, thanks to terrific service, excellent drinks and awesome entertainment. Images features live bands that bring the show to you, while performing the hit songs that will have you on your feet moving to the beat. Exciting atmosphere, friendly staff and sensational entertainment all keep the party going at Images! For those who are on the go, choose from one of our many fast food options, including Tower Creamery, Starbucks, Mookies Gourmet Creamery & Cookies, Tower Pizzeria, McDonald’s, El Nopal Mexican Grill, and Chicago Hot Dog . This hotel offers a seasonal outdoor pool complex with spa tub, water volleyball, and rental cabanas. You'll aslo love the large casino, fitness center, spa, fine dining, and more! Our Casino offers thousands of state-of-the-art gaming options from slots and table games to an action-packed Race and Sports Book and Live Poker Room. Slots & Video Poker: Over 800 exciting slot and video poker games, with great odds to ensure you keep on winning. Table Games: More than 45 of the hottest table games, including blackjack, roulette, craps, and Crapless Craps. Poker: Over 15 poker tables for daily, no-limit tournaments. Race & Sports Book: We feature a thrilling Las Vegas Race & Sports Book with outstanding contests and special events. Join ace|PLAY™ and receive the best value for your casino play. Get in on the Game with awards, comps and exclusives for members. Jutting 1,149 feet into the Vegas skyline, the iconic Stratosphere Tower is the tallest freestanding observation tower in the United States and one of the most exciting attractions among Las Vegas resorts. Our exceptional Vegas resort hotel offers one-of-a-kind thrills you can’t find anywhere else in Las Vegas, including the world’s highest thrill rides – Big Shot, X-Scream, and Insanity. Our biggest thrill, SkyJump Las Vegas, is a controlled descent that sends you off the 108th floor of our Vegas resort Tower at a scream-inducing speed. So, if you’re an adrenaline junkie, a thrill seeker, or a daredevil – our Vegas resort Tower is the place for you. * Valid for up to four (4) guests staying in the same room. This itinerary takes you to four of the most romantic and beautiful cities in the world. Each has a different style, but each will captivate and charm you with beautiful architecture, interesting cuisine and impressive history. After landing and clearing customs, claim your bags and meet your driver who will transfer you to your hotel. You have the rest of the day to see Paris on your own. Paris is an eminently walkable city, so drop your bags and go for a walk! Today you continue your exploration of Paris on your own—choose to explore one or more of the many churches and museums that fill the city. 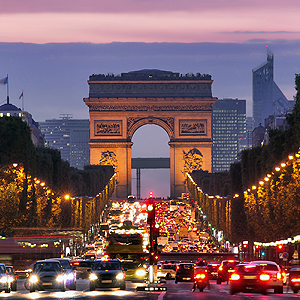 In the evening, the "City of Lights" will unfold before your eyes on a Private Paris by Night Tour in a Classic Car with Champagne. You'll be picked up at your hotel at 8:30pm for this tour, which is designed to discover the most beautiful monuments of Paris as they are illuminated at night. 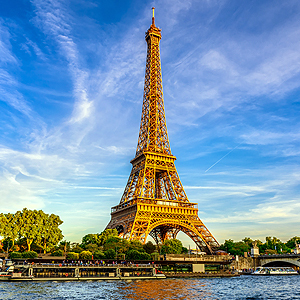 Highlights which you will drive past include: Avenue des Champs Elysees, Arc de Triomphe, Trocadero, Eiffel Tower, Invalides, Pont Alexander, the Petite and Grand Palais, Place de la Concorde, Opera Garnier, Place Vendome, Pyramide du Louvre, Notre Dame and Hotel de Ville. The illuminated views of these classic and elegant sights will leave an indelible memory in your mind! After touring the highlights of central Paris you will be driven around the famous sites of the village of Montmartre, including the Moulin Rouge, the Pigalle, and Sacre Coeur. Included with your tour is a bottle of champagne to enjoy along the way! Stops for photographs are possible - be sure to tell your driver if there is something in particular you wish to see during your tour! Please note that tour does not stop for visits to sites. Today is free for you to continue exploring Paris on your own. 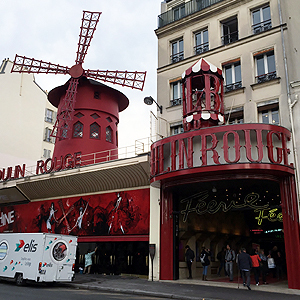 At 6 p.m. you'll be picked up at your hotel for a four-hour Moulin Rouge Show with Dinner. The Moulin Rouge is the most famous cabaret of Paris opened in 1888. Toulouse-Lautrec, one of the more regular clients, was the great witness of this 19th century establishment. Among his paintings, seventeen are directly inspired by the Moulin Rouge, and many are famous worldwide. It was six years after World War II before the Moulin Rouge recovered its former magnificence. Family owned, the Moulin Rouge continues the great tradition of the Bal Populaire. The current show Feerie consists of a troop of 100 artists, including the 60 Chorus Girls who are recruited world-wide, 1000 costumes of feathers, rhinestones and sequins created in the most famous Parisian workshops, sumptuous sets in shimmering colors uniquely designed by Italian artists, the best and most outstanding international acts and the awaited return of the giant aquarium! Before the show begins, you'll have a three-course dinner with choices for each course. A half bottle of red or white wine or champagne per person is included. We know you'll enjoy this unforgettable evening at the Moulin Rouge! This morning after breakfast, take your private transfer to Paris Airport for your flight to Budapest. On arrival in Budapest, a driver will meet you for your private transfer to your hotel. You have the rest of the day to relax or to begin exploring Budapest on your own. 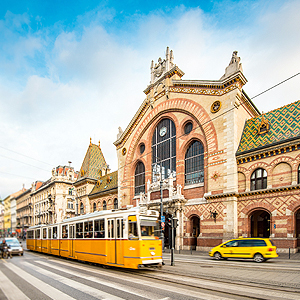 This morning, continue exploring Budapest on your own. We suggest a visit to the Central Market—one of the largest in Europe—where you can see several different kinds of paprika and other delicacies of Hungarian cuisine. It's a good spot to have lunch at one of the many cafés. 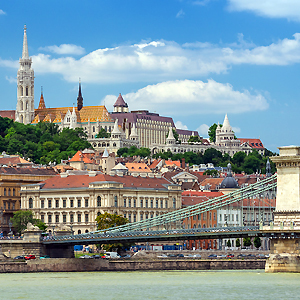 Budapest is made up of two cities: hilly Buda on the west side of the Danube, and flat Pest on the east side. 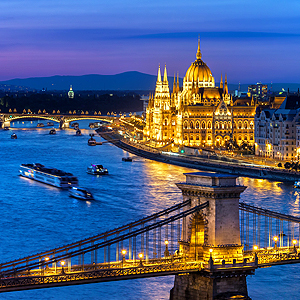 One of the world's most beautiful cities, Budapest offers an interesting mix of Baroque, Neoclassical and Art Nouveau architecture. Dominating the riverfront on the Pest side is the neo-Gothic National Parliament—the largest building in Hungary. At 2:00pm, meet your English-speaking guide to begin your 3-hour Private Wine Bar Walking Tour. Thanks to the increasing number of wine bars, you don't have to leave Budapest to become acquainted with Hungarian wine. But where to start and what to order? Let us help you. On our guided Wine Bar Tour we will take you to two of Budapest's interesting centrally located wine bars. Most wines will be from small producers, many of whom do not export their wines. Snacks and wine tasting are included. In the late afternoon, you have free time. Today you have free time to explore Budapest. Walk across the Danube via the Chain Bridge and take the funicular up to Castle area. Nearby is Matthias Church, a neo-Gothic historic church of which some parts are over 500 years old. Then visit the nearby Fishermen's Bastion lookout for stunning views of the Danube. On the Pest side, the Széchenyi Medicinal Bath is the largest medicinal bath in Europe, and well worth a visit to remove your aches and pains from all that walking! This evening, enjoy a River Cruise with Dinner and Live Music. While enjoying your dinner, you will be listening to 3 artists of the Rajko Gypsy Orchestra live. The show features an extremely talented player of the most famous Hungarian instrument, the cimbalom as well. During the performance, guests will have a chance to ask for their favorite songs from the artists to play. A perfect way to say farewell to Budapest! This morning after breakfast, take your private transfer to the Budapest Airport for your flight to Rome. 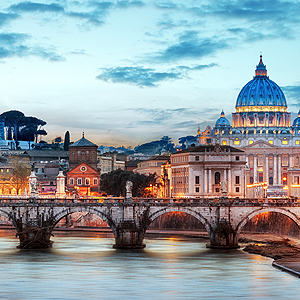 On arrival in Rome, a driver will meet you for your private transfer to your hotel. You have the rest of the day to relax or to begin exploring Rome on your own. Today you will have a 3-hour Private Panoramic Rome Tour with an English-speaking driving guide. 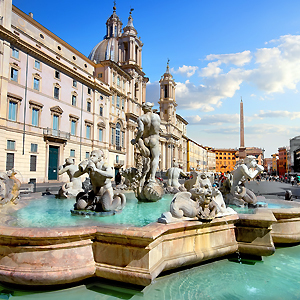 You'll see the highlights of the Eternal City, including St. Peter's Square, the Colosseum, the Roman Forum, Piazza Navona, and the Trevi Fountain. Stops will allow time for photographs. After the tour, you have the rest of the day free for exploration on your own. Today is a free day for you to explore Rome on your own. Perhaps you would like to spend more time in the Forum, or visit the museums on Capitoline Hill that were designed by Michelangelo. In the evening, you'll be picked up at your hotel for a Private Dinner at Palazzo Taverna. Palazzo Taverna is the ideal setting for a sophisticated and yet relaxing dinner, during which the finest ingredients will be masterfully combined and an exquisite Italian meal prepared right before your eyes. The apartment is located in the historical Palazzo Taverna, in the surroundings of Piazza Navona. The Palazzo, one of the finest and most evocative among the many built in the area, was the seat of the noble Orsini family and hosted the highest personalities of the time. After an enjoyable dinner, return to your hotel is on your own. This morning after checking out you will be transferred to the train station for your 3½-hour rail journey to Venice by 1st-class train. Upon arrival in Venice, transfer to your hotel. You have the rest of the day to explore the beautiful pedestrian streets and canals of the "most serene" city. 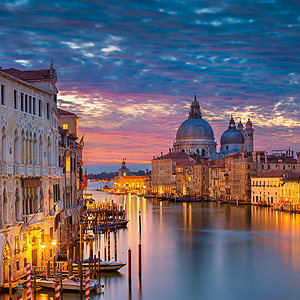 Welcome to "La Serenissima," regarded by many as the most beautiful city in the world! You have the morning free to explore on your own. In addition to walking the car-free streets and alleys, you could take a Vaporetto (water taxi) in a circular tour, allowing you to see many of the grand palaces and churches from the water. In the afternoon, an English-speaking guide will meet you at your hotel for a Private Walking Tour with Stops for Aperitifs. This tour is a combination of art and gastronomic tradition. 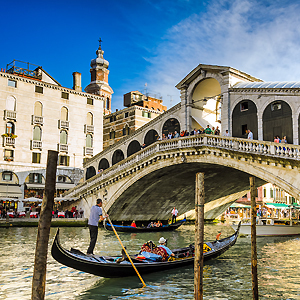 The itinerary includes the Rialto Bridge area, the Frari Church (where masterpieces by the most famous Venetian artists such as Tiziano, Bellini, and Canova can be found), and the Carampane, San Polo, and San Bartolomeo neighborhoods. During the tour you will stop at two bacaris, typical Venetian wine bars, well patronized by the locals who love to stop and have a quick glass of wine or prosecco with a small snack as an aperitif before lunch or dinner. This is an experience not to be missed while in Venice. Today is free for you to continue exploring Venice on your own. Don't miss seeing the inside of St. Mark's Cathedral, and perhaps have a morning coffee at one of the (expensive) cafés in Piazza San Marco—which Napoleon called "Europe's Drawing Room." In the late afternoon, find your way to Bacino Orseolo Gondola Station for your Private Gondola Serenade, a private and romantic promenade by gondola with music and songs that will make you dream along the canals of Venice.This boat ride, accompanied by a singing gondolier, should be a lasting memory of your visit to Venice. 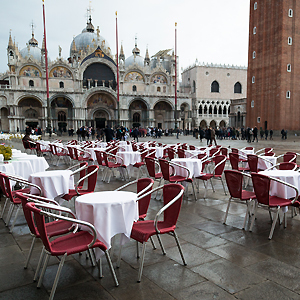 If the weather permits, consider having dinner at one of the many restaurants and trattoria with outdoor seating, for your final dinner of this adventure! Today you say farewell to Europe as you have a private transfer to the Venice Airport, for your flight back to New York (or other selected city). 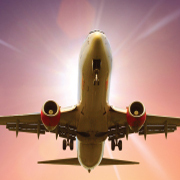 *Flights from other U.S. departure cities also available.